Many advisors speak at clients rather than to them, unknowingly detouring into financial frivolity. Terms like yield curve, alpha, support and resistance levels, factor investing, and risk premium confuse, bore, and scare civilians. What do average people want to know? What? No mention of Brexit? Banks are guilty of speaking in financial tongues. VisibleThread determined 58% of their content doesn’t work. Typical U.S. consumers read at an eighth-grade level. 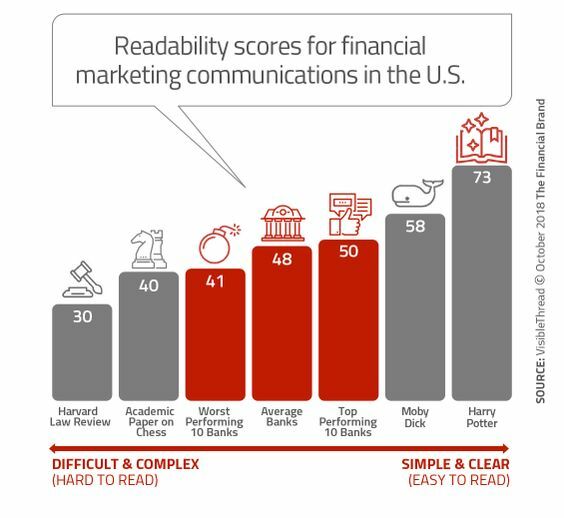 Financial firms use inappropriate words and jargon. Long sentences fuel confusion regarding complex financial topics. Target-date funds are popular in retirement accounts. Do investors understand them? Not according to a study completed by AllianceBernstein. 38% of respondents believe their target-date fund will never go down. Almost half believe it will meet their income needs in retirement. Another 39% said this is what their advisor told them. 45% think target-date funds are insured by the federal government. Investment advisors need to back up and digest this information before breaking out data and charting intensive 300-page financial plans. Focusing on simple concepts like investment costs, diversification and client behavior is a preferable approach. These are controllable items, unlike the wild swings of the markets. Much could be learned from President Franklin Delano Roosevelt? His conversational tone stopped devastating bank runs in 1933. From personal experience, we endorse this concept. Many times we need to explain to clients that IRAs aren’t an investment. The investments go inside these accounts. One client worked for a company for close to 50 years. Upon retirement, he received a lump sum in lieu of a pension and needed to roll over his 401(K). What was he concerned about? The growth vs. value debate? The spread between junk bonds and treasuries? What freaked him out was the idea of receiving two large checks and not knowing how to move them into his IRA. The transfer process was literally giving him chest pains. Once we reassured him, his anxiety level decreased dramatically. The masses have zero desire to dive into the weeds of investment theories or macro analysis of economics. If they were interested, they would be doing this themselves – not paying someone else. Addressing client’s concerns is the best way to impress them. Evidence-based investing includes speaking about topics clients are interested in – not the ones you are. Source: Leadership In Turbulent Times by Doris Kearns Goodwin. What are the top 10 financial behaviors?